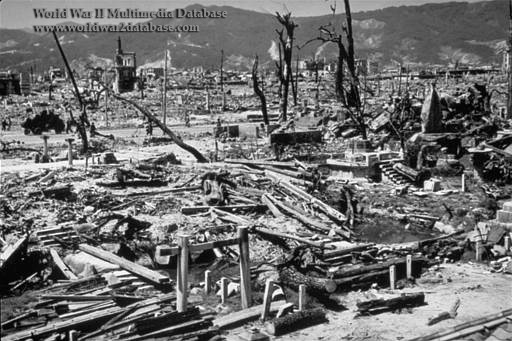 Nakajima-hon-machi District debris from the blast wave and the heat wave after atomic attack. Koa Fire Insurance Building on Kamiyacho Road, 1300 feet (400 meters) from the hypocenter, is top left. Near downtown Hiroshima, the Ota River divides into two branches, becoming the Hon and the Motoyasu rivers. Today, known as Nakajima-cho District, it is occupied by the Peace Memorial Park; no one lives there. But before the bombing, Nakajima was home to about 4,400 people living in 1,300 households in six distinct neighborhoods: Nakajima-honmachi, Zaimoku-cho, Tenjin-machi, Motoyanagi-machi, Kobiki-cho, and Nakajima-shinmachi. Jisenji-no-hana Park, a popular gathering place, was also there. Immediately after the bomb, the burned and injured sought to cool themselves in the water, and when the firestorm hit, everyone tried to seek shelter in the rivers. Most were too injured to swim. Thousands of people drowned or suffocated to death. The sheer number of corpses led to a huge health emergency, with rats and flies infesting the wounds of the living.